Good evening. I'm in quite a good mood tonight. I restarted my anime marathon addiction. Around December 2011 I had put watching anime on hiatus mainly because I got sick and tired of the repeating (naive) storylines. But last night I realised that I had a lot of stress built up from "life", and it occurred to me that I had been feeling pretty depressed for over two months. I knew I needed a way of releasing these negative emotions. Previously, I found that drowning myself in music was an effective solution. Sadly, as of last week this antidote stopped working; No matter what music I listened to (even my beloved Gackt), they were not able to lift me from my depression hole. Last night I decided to start watching anime again, and it was a good decision. I'm feeling pretty good right now, having watched two animes, Another and Chaos;Head (edit: I also watched Accel World). As you may have noticed, today I posted an anime review on Another. This review (and hopefully many more to come) is independent of the anime reviews that MegaBubbletea has been writing, and the opinions are solely mine, pumpkin_so77. Back to topic, tonight I want to share a song from one of my favourite animes Hakuouki. There's plenty of bishies to drool over in this anime so get your towels ready! 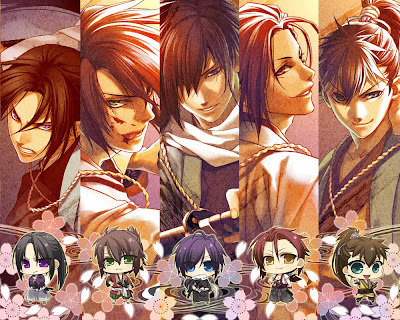 Notes: Opening song for the anime Hakuouki: Hekketsu-roku.